Two species of fire ants are found in Florida. Most notorious is Solenopsis invicta Buren, the red imported fire ant (RIFA), followed by the much less common Solenopsis geminata (Fabricius), the tropical or native fire ant. Other more common U.S. members of this genus include Solenopsis xyloni McCook, the southern fire ant; Solenopsis aurea Wheeler, found in western states; and Solenopsis richteri Forel, the black imported fire ant, confined to northeastern Mississippi and northwestern Alabama. Figure 1. Lateral view of a worker of the red imported fire ant, Solenopsis invicta Buren. Photograph by David Almquist, University of Florida. RIFA is native to central South America. It is also established in the U.S. and Australia (Queensland, near Brisbane - as of 2001) (Shattuck and Barnett 2005). It has been reported in Antigua and Barbuda, Bahamas, the British and U.S. Virgin Islands, Cayman Islands, Hong Kong, Malaysia, Singapore, Taiwan, Trinidad and Tobago, and the Turks and Caicos Islands (ISSG 2006). Populations in New Zealand and mainland China are either currently eradicated (N.Z.) or undergoing eradication (China) (ISSG 2006). In the U.S., RIFA was first introduced from Brazil into either Mobile, Alabama, or Pensacola, Florida, between 1933 and 1945. However, the RIFA infests Puerto Rico, and all or part of many southern and western states from Maryland to southern California (Mobley and Redding 2005). 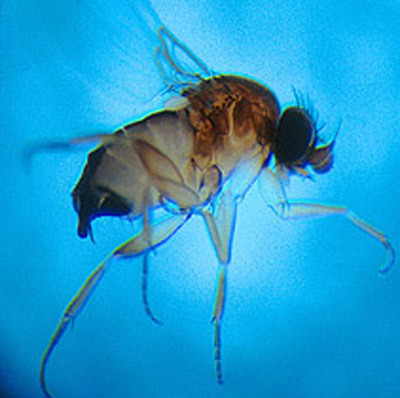 As of August 2008, the following U.S. states have established infestations: Alabama, Arkansas, California, Florida, Georgia, Louisiana, Maryland, Mississippi, New Mexico, North Carolina, South Carolina, Oklahoma, Tennessee, Texas, and Virginia. The infestations in Maryland and Virginia are sparse and still not formally recognized on USDA maps. Small, localized populations exist in the San Francisco Bay area (David Williams, personal communication, 18 August 2008). Originally, S. invicta was believed to be a red form of the black species S. saevissima richteri Forel. 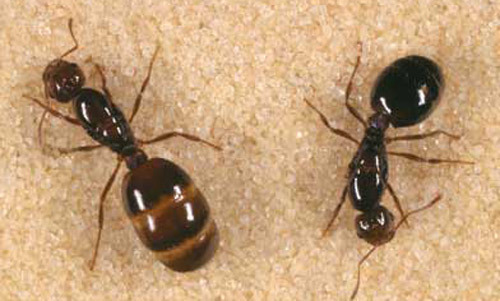 In 1972, Buren described the black imported fire ant to be a separate and distinct species, S. richteri Forel, and the RIFA was identified as S. invicta Buren (Hedges 1997). Literature dated earlier than 1972 referring to the biology and control of "S. saevissima richteri" almost exclusively refers to S. invicta (Ebeling 1975). Some literature found may contain the name S. wagneri, which refers to S. invicta (Shattuck et al. 1999). The pedicel, or "waist" in the RIFA consists of two segments. Workers consist of many sizes (polymorphic) between 2.4 to 6 mm (1/8 to 1/4 in) (Hedges 1998). The mandible has four distinct teeth and the antennae are 10-segmented, ending in a two-segmented club. A sting is present at the tip of the gaster. Body color is usually red to brown in color with a black gaster (Hedges 1997). Figure 2. Lateral view of a media worker of the red imported fire ant, Solenopsis invicta Buren. AC = antennal club; ME = mesopleuron; MF = mesopleural flange; PE = petiole; PR = propodeum. Photograph by FDACS Division of Plant Industry. Figure 3. Head of a worker of the red imported fire ant, Solenopsis invicta Buren. Photograph by David Almquist, University of Florida. Figure 4. Head of a minor worker of the red imported fire ant, Solenopsis invicta Buren. AC = antennal club; CT = clypeal tooth; MCT = medial clypeal tooth. FDACS Division of Plant Industry. Figure 5. Propodeum (the first abdominal segment) of a minor worker of the red imported fire ant, Solenopsis invicta Buren. Photograph by FDACS Division of Plant Industry. Mounds are built of soil and are seldom larger than 46 cm (18 in) in diameter. When a mound is disturbed, ants emerge aggressively to bite and sting the intruder. A white pustule usually appears the next day at the site of the sting (Cohen 1992). It is important to distinguish between the RIFA and the native fire ant in order for appropriate control measures to be taken. Mounds of S. geminata will contain workers with square-shaped heads that are larger in proportion to the rest of their body. These workers collect and mill seeds for the colony (Drees 1997). Workers of S. invicta do not have workers with disproportionate head to body ratios. Figure 6. Worker size range of the red imported fire ant, Solenopsis invicta Buren. Photograph by Sanford D. Porter, USDA, Gainesville, FL. Figure 7. Typical colony of the red imported fire ant, Solenopsis invicta Buren. Photograph by Sanford D. Porter, USDA, Gainesville, FL. Figure 8. Mound of the red imported fire ant, Solenopsis invicta Buren, in St. Augustinegrass. Photograph by Rudolf Scheffrahn, University of Florida. The lifespan of RIFA workers depends on their size. Minor workers may live 30 to 60 days, media workers 60 to 90 days, major workers 90 to 180 days, and queens may live two to six years. Complete lifecycle from egg to adult takes between 22 and 38 days (Hedges 1997). Mating flights are the primary means of colony propagation, secondarily, budding can occur in which a portion of a colony becomes an autonomous unit. After the colony reaches one year of age, reproductive alates are produced. Six to eight mating flights consisting of up to 4,500 alates each occur between the spring and fall (Vinson and Sorenson 1986). Mating flights usually occur midday on a warm (>74°F/24°C), sunny day following rain (Hedges 1997). Mating occurs during flight and the males die soon after mating with females. In the southern United States, as many as 97,000 queens may be produced per acre of infested land per year (Vinson and Sorenson 1986). Alates are often attracted to swimming pools where homeowners can find thousands of winged ants trapped on the water's surface (Hedges 1997). After mating flights occur, it is common to find newly-mated queens clustered together under shelter. This clustering and the cooperation of the newly-mated queens aid in establishing a colony. However, as the colony grows all but one queen will be killed, except in the instance of multiple queen colonies (Vinson and Sorenson 1986). Once the female alate has mated, she will rake her legs forward to snap her wings off at the basal suture and find a suitable spot to begin a new colony (Holldobler 1990). Often this spot is under rocks, leaves or in a small crack or crevice, such as at the edge of a sidewalk, driveway, or street. The queen will burrow into the soil to excavate a small chamber, which is sealed off to keep predators out. Within 24 hours of mating, the queen will have laid between 10 to 15 eggs, which will hatch in eight to 10 days. By the time the first group of eggs hatch, the queen will have laid from 75 to 125 more eggs. The larval stage typically lasts six to 12 days and the pupal stage for nine to 16 days. The newly-mated queen will stop laying eggs until the first batch of workers mature. This process takes from two weeks to one month. The queen will feed the first batch of young larvae oils regurgitated from her crop, trophic eggs or secretions from her salivary glands. The queen's wing muscles, which are no longer needed, break down to provide the nutrients for the young larvae (Vinson and Sorenson 1986). The first workers to emerge are characteristically small due to the limitations in nutrients that the queen provides. These workers, termed "minims," burrow out of the chamber and begin foraging for food to feed the queen and new larvae. The minims also begin construction of the mound. Within one month, larger workers are being produced and the mound is growing in size. By six months the colony has reached several thousand workers and the mound can be seen in a field or lawn. Colonies of this size generally contain a few large workers (major workers), many medium sized workers (median workers), and a majority of small workers (minor workers). The three types of workers are all sterile females and serve to perform tasks necessary to maintain the colony. The queen is the single producer of eggs and is capable of producing as many as 1,500 eggs per day. Mature RIFA colonies may contain as many as 240,000 workers with a typical colony consisting of 80,000 workers (Vinson and Sorenson 1986). The diet of foraging workers consists of dead animals, including insects, earthworms, and vertebrates. Workers also collect honeydew and will forage for sweets, proteins, and fats in homes. They are sometimes attracted to piles of dirty laundry. Larvae are fed only a liquid diet until they reach the third instar. When the larvae reach the fourth instar, they are able to digest solid foods. Worker ants will bring solid food rich in protein and deposit it in a depression in front of the mouth of the larvae. 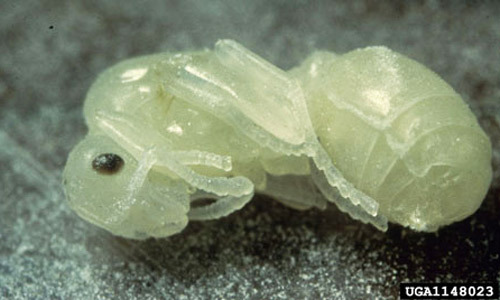 The larvae will secrete digestive enzymes that break down the solid food and regurgitate it back to worker ants. The queen is fed some of the digested protein to support egg production. As long as food is plentiful, egg production is at its maximum (Vinson and Sorenson 1986). The sting of the RIFA possesses venom of an alkaloid nature, which exhibits potent necrotoxic activity. Approximately 95% of the venom is composed of these alkaloids, which are responsible for both the pain and white pustule that appears approximately one day after the sting occurs. The remainder of the venom contains an aqueous solution of proteins, peptides, and other small molecules that produce the allergic reaction in hypersensitive individuals. Worker fire ants will attach to the skin using their mandibles and will subsequently lower the tip of the gaster to inject the stinger into the victim. Thus, fire ants both bite and sting, but only the sting is responsible for the pain and pustule (Goddard 1996). Figure 9. Larval stage of the red imported fire ant, Solenopsis invicta Buren. Photograph by Sanford D. Porter, USDA, Gainesville, FL. Figure 10. Pupal stage of the red imported fire ant, Solenopsis invicta Buren. Photograph by USDA APHIS PPQ Imported Fire Ant Station Archives, www.insectimages.org. Figure 11. Red imported fire ants, Solenopsis invicta Buren, foraging and recruiting a cricket. Photograph by Sanford D. Porter, USDA, Gainesville, FL. Figure 12. Red imported fire ant, Solenopsis invicta Buren, stinging and biting. Photograph by Sanford D. Porter, USDA, Gainesville, FL. Figure 13. White pustules formed after attack by the red imported fire ant, Solenopsis invicta Buren. Photograph by Sanford D. Porter, USDA, Gainesville, FL. Early studies of imported fire ant biology indicated that colonies contained single queens (monogyne). However, since 1973, reports have become more frequent of the occurrence of multiple queen (polygyne) colonies. Multiple queen colonies have been found in areas of Florida, Mississippi, Louisiana, Texas, and Georgia, being more frequent in the western edge of their range (Vinson and Sorenson 1986). Multiple queen colonies differ from single queen colonies in several ways: (1) the mounds are closer together and more numerous per acre of land, (2) the colonies have smaller workers with fewer major workers present, (3) workers are not aggressive towards neighboring colonies, and (4) the queens weigh less and produce fewer eggs than single queens. The overall number of eggs produced in a multiple queen colony is higher than in a single queen colony due to the presence of many queens producing eggs simultaneously. Additionally, fewer reproductive alates of fire ants are produced with the males often being sterile and the females weighing less (Hedges 1998, Vinson and Sorenson 1986). Figure 14. Polygyne colony of the red imported fire ant, Solenopsis invicta Buren. Photograph by Sanford D. Porter, USDA, Gainesville, FL. Since the introduction of the RIFA, it has become a major agricultural and urban pest throughout the southeastern states. In addition, fire ants cause both medical and environmental harm (Stimac and Alves 1994). In agriculture, the RIFA frequently invades soybean crops and heavy infestations invariably yield fewer soybeans (Lofgren and Adams 1981). In Georgia and North Carolina, it has been reported that RIFA mounds caused direct interference with combine operation resulting in 16.8 to 49.1 kg/ha of soybeans to not be harvested (Adams et al. 1976, 1977). Banks et al. (1990) reported that the RIFA could cause as much as $156.4 million dollars in losses for soybean crops. Opportunistic feeding on the young tender growth by red imported fire ant occurs throughout the year and can cause significant damage not only to soybean crops, but citrus, corn, okra, bean, cabbage, cucumber, eggplant, potato, sweet potato, peanut, sorghum, and sunflower (Stimac and Alves 1994). Monetary losses occur when RIFA interfere with the root system of the plant, mechanically disable combine operation, or feed on the young growth of plants to reduce stands (Stimac and Alves 1994). In urban settings, the RIFA may nest under patio slabs, in lawns, under edges of sidewalks, foundations, concrete driveways, and electrical boxes. After a heavy rain, the colony may move to higher ground or inside homes to take refuge from saturated soil. If nesting under patio slabs or concrete walkways, the nest cavity may cause the concrete slab to fall and cause damage to the sidewalk (Vinson and Sorenson 1986). Red imported fire ants have been reported to reduce ground-nesting populations of rodents and birds. In certain instances, the RIFA may completely eliminate ground-nesting species from a given area (Vinson and Sorenson 1986). Because there is a 10 to 20 year lapse before reductions in bird populations are observed, it has been suggested that actual effects of the RIFA on animal populations may be underestimated (Mount 1981). The human toll from RIFA stings is an important public health concern. Stings may produce a large range of reactions from localized pain and swelling to anaphylactic shock, making it hard to estimate the cost to public health. The cost associated with the control of the RIFA is significant. An estimated cost of about $36 per household is associated with the presence of fire ants (Diffie and Sheppard 1990). State and federal agencies have spent more than $250 million in total in order to control or eradicate the fire ant. Private agencies and individuals spend $25 to 40 million yearly for chemical pesticides for fire ant control (Stimac and Alves 1994). Figure 15. Dead baby bird being consumed by red imported fire ants, Solenopsis invicta Buren. Photograph by Sanford D. Porter, USDA, Gainesville, FL. Fire ants frequently invade home lawns, school yards, athletic fields, golf courses, parks and other recreational areas. Additionally, electrical equipment and utility housing, home gardens, compost piles, mulched flowerbeds, pavement cracks, and the perimeter of bodies of water must all be considered when choosing a method of control. Two approaches can be taken to effectively manage imported fire ants. Single mound treatments or area-wide broadcast applications usually manage red imported fire ant populations. There are many methods of treating individual mounds. The main advantage to this process is that there are so many choices available to homeowners and pest control operators, though few may actually eliminate the colony. However, the largest disadvantage is that individual mounds must each be located in order to be treated. Individual mound treatments are most beneficial when there are native ants in the same area as imported fire ants. Reinfestation of any treated area, whether by broadcast treatment or individual mound treatment may occur. Six methods of individual mound treatment are available (Vinson and Sorenson 1986). Mound Drenches. Large volumes of liquid toxic to ants are poured over a mound. Liquids can range from using several gallons of hot water to insecticides mixed with several gallons of water. This method may not reach the queen, which may be deep in the nest, thus preventing colony elimination. Surface Dusts. This method is very similar to mound drenches. A dust or granular insecticide is applied over the top of the mound and then watered into the soil. Mound Injections. The use of insecticides that may be pressurized and injected into a mound. Often this method is more expensive, but more effective, than mound drenches. However, more time may be required for this method and leakage of the insecticide by the equipment may be hazardous to the handler. Again, the queen may not be affected and thus reinfestation may occur. Baits. Baits can be used for both individual mound and broadcast applications. A small amount of the bait is sprinkled around the mound and the ants then forage and bring the bait back to the colony to feed on. This method is slower acting, but more effective then drenching, dusting, or fumigating a mound because the workers will feed the bait to the queen and brood, thus gaining effective control of the colony. Mechanical Control. Certain mechanical and electrical devices are on the market for controlling fire ants, but the efficacy has not been documented (Vinson and Sorenson 1986). Home Remedies. Many homeowners will choose to pour boiling water or ignite flammable liquids over a mound. While these methods may bring about control, they are not recommended because they are both very dangerous, not only to humans, but also to the environment. Currently, there are only a few products available for broadcast treatment of large areas. These products are either granular insecticides or baits composed of soybean oil and toxicant on a corn grit carrier. These granules are broadcast over a large area and, upon discovery by the ants, are carried to the colony and fed to nestmates and the queen. This is a very effective treatment but does present problems because (1) some of the bait may be dropped where the ants may not find it, (2) some colonies are well fed so do not feed upon the bait, (3) some baits are light sensitive (as with hydramethylnon) and may inactivate before discovery by the ants, and (4) the baits are not specific to the imported fire ant (Vinson and Sorenson 1986). Current research is leading the way for introduction of natural enemies of the red imported fire ant. Two hopeful pathogens are the microsporidian protozoan Thelohania solenopsae and the fungus Beauveria bassiana. Two parasitoid flies from South America, Pseudacteon tricuspis and Pseudacteon curvatus have been introduced into the southern states. These flies decapitate worker ants in the final stages of larval development. 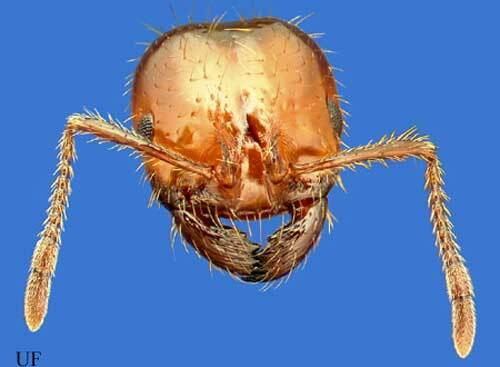 In addition, a parasitic ant, Solenopsis daguerri (Santschi) which invades fire ant colonies and replaces the queen to take control of the colony, is being investigated for another possible biological control agent of the red imported fire ant. Figure 16. Queens of the red imported fire ant, Solenopsis invicta Buren. The one on the right is from a polygyne colony and is infected with the microsporidian protozoan Thelohania solenopsae. The one on the left is a healthy queen from a monogyne colony. Photograph by Lyle J. Buss, University of Florida. Figure 17. Pseudacteon sp. One of the two species of parasitoid flies from South America, introduced into the southern states to help manage red imported fire ant populations. Photograph by Sanford D. Porter, USDA. Figure 18. 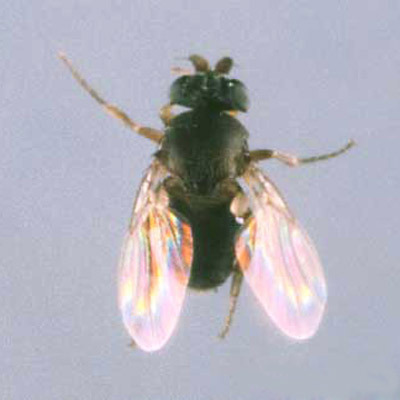 Dorsal view of Pseudacteon tricuspis, a parasitic fly that attacks the red imported fire ant, Solenopsis invicta Buren. One of the two species of parasitoid flies from South America, introduced into the southern states to help manage red imported fire ant populations. Photograph by Lyle J. Buss, University of Florida. Adams CT, Plumley JK, Lofgren CS, Banks WA. 1976. Economic Importance of the red imported fire ant, Solenopsis invicta Buren. I. Preliminary investigations of impact on soybean harvest. Journal of the Georgia Entomological Society 11: 165-169. Adams CT, Plumley JK, Banks WA Lofgren CS. 1977. Impact of red imported fire ant, Solenopsis invicta Buren (Hymenoptera: Formicidae) on harvest of soybean in North Carolina. Journal of the Elisha Mitchell Society 93: 150-152. Banks WA, Adams CT, Lofgren CS, Wojcik DP. 1990. Imported fire ant infestation of soybean fields in the southern United States. Florida Entomologist 73: 503-504. Cohen PR. 1992. Imported fire ant stings: clinical manifestations and treatment. Pediatric Dermatology 9: 44-48. Diffie S, Sheppard C. 1990. Impact of imported fire ants on Georgia Homeowners. In 1990 Imported Fire Ant Conference (Mispagel ME, editor) pp. 62-71. Texas A&M University, College Station, Texas. Drees BM. (1997). We're all on the same team when tracking fire ants. http://fireant.tamu.edu/ (22 June 2000). Durham S. (2008). Nine to 20 individual fire ant queens started U.S. fire ant population. USDA-ARS Press Releases. http://www.ars.usda.gov/is/pr/2008/080730.htm (1 August 2008). Ebeling W. 1975. Urban Entomology. University of California Division of Agricultural Sciences pp. 348-350. Goddard J. 1996. Physicians Guide To Arthropods of Medical Importance. pp. 374. CRC Press, NY. Hedges SA. 1997. Handbook of Pest Control, 8th Ed. (Moreland D, editor) pp. 531-535. Mallis Handbook and Technical Training Company. Hedges SA. 1998. Field Guide for the Management of Structure Infesting Ants, 2nd Ed. (Moreland D, editor) pp. 202-216. G.I.E. Publishers, Cleveland, Ohio. Hölldobler B, Wilson EO. 1990. The Ants. pp. 165. Belknap Press. ISSG. (2006). Solenopsis invicta (insect). Global Invasive Species Database. http://www.issg.org/database/species/distribution.asp?si=77&fr=1&sts=&lang=EN (18 August 2008). Lofgren CS, Adams CT. 1981. Reduced yield of soybeans in fields infested with the red imported fire ant, Solenopsis invicta Buren. Florida Entomologist 64: 199-202. Mobley D, Redding J. (2005). 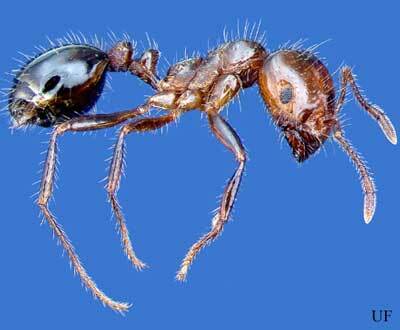 USDA amends imported fire ant quarantine. USDA-APHIS Press Releases. http://www.aphis.usda.gov/lpa/news/2005/08/fireantq_ppq.html (10 August 2005). Mount RH. 1981. The red imported fire ant, Solenopsis invicta (Hymenoptera: Formicidae) as a possible serious predator on some southeastern vertebrates: direct observations and subjective impressions. Journal of the Alabama Academy of Science 52: 71-78. Shattuck SO, Porter SD, Wojcik DP. 1999. Solenopsis invicta Buren, 1972 (Insecta, Hymenoptera): proposed conservation of specific name. Bulletin of Zoological Nomenclature 56: 27-30. Shattuck SO, Barnett NJ. (2005). Genus Solenopsis. Australian Ants Online. http://www.ento.csiro.au/science/ants/myrmicinae/solenopsis/solenopsis_tax_cat.htm (18 August 2008). Stimac JL, Alves SB. 1994. Pest Management in the Subtropics: Biological Control A Florida Perspective. (Rosen D, Bennett FD, Capinera JL, Editors) pp. 353-380. Intercept Limited, Andover, Hants, SP10 1 YG, UK. USDA. (2007). Areawide Suppression of Fire Ants. http://www.ars.usda.gov/fireant/ (18 August 2008). Vinson SB, Sorenson, AA. 1986. Imported Fire Ants: Life History and Impact. The Texas Department of Agriculture. P. O. Box 12847, Austin, Texas 78711. Photographs and Graphics: Sanford D. Porter USDA; David Almquist, Rudolf Scheffrahn and Lyle J. Buss, University of Florida; and FDACS Division of Plant Industry. Publication Date: January 2001. Latest revision: December 2016.